On our last day in Florida, C insisted on taking me to one of Fort Myers' oldest haunts -- The State Farmer's Market. This place is straight out of the 50s, and serves old-fashioned fare to a contingent of workmen and locals. Our lunch for four included meat loaf for Mom, fried catfish for Dad, country fried steak for C & top round for me. 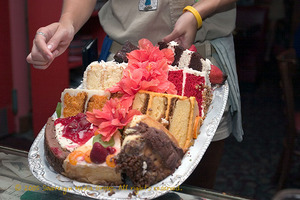 Now, If you hadn't gotten the idea already, nearly every meal we had in Florida came with a ridiculous number of "sides." State Farmer's takes it to a whole new level--with each entree, you choose three side dishes from the sixteen available. Yup, you read that right. That picture up there is one of them. 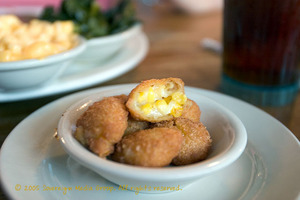 It's a corn fritter, kind of like a fresher, whole corn hush puppy. And man, was it good. The corn kernels burst with sweet fresh corn flavor, balancing the heavy batter quite a bit. Last night's dinner was one of those that C asks me to PLEASE write down, lest I forget it and can never recreate it. I have to agree that it was raelly delicious, very simple and equally suited to all the seasons. I made a Mushroom Tagliatelle that I served with roasted prosciutto-wrapped apricots. 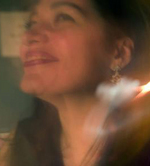 In the Fall & Winter, you might do something a little heartier than fruit as an accompaniment. So, this meme has made its way to Gastronomie via Alice at Epicurean Debauchery... It's a fun one. Truthfully (and here's where I differ from a lot of my fellow food bloggers), I really never did much cooking when I was a kid. Oh, I made my fair share of noodle "play-doh", and enjoyed the chemistry of mixing condiments and seasonings, but I can't remember actually cooking an edible dish for someone until I went off to college--Mom, am I forgetting something? Most definitely my mom. As I've said before on this blog, she's the best chef in the family, and I think I picked up her ability to fine-tune a dish. Nope... don't have one. The closest picture I have to anything culinary is me, at the age of 7 or so, wearing big, yellow rubber gloves and an apron, positively thrilled at having the chance to do dishes after one of my parents' parties--I got to hang out with all the ladies in the kitchen. Pastry/pie dough makes me want to cry. I adore my Kyocera ceramic mandolin, all of my Microplanes and my enormous bamboo butcher block. I also love my Santoku and my tomato knife (I was given the latter as a shower gift, and never thought I'd use it. It's turned out to be a wonderful knife, and far more multi-purpose than I expected). I love, love, love Raisinettes and popcorn at the movie theatre--3 kernels to one raisinette. I also love the balance that comes from mixing dark miso paste with tamarind paste--I always have a batch made up in the fridge for quick glazes and marinades. Oh, and C makes a "grossed-out" face every time I put a spoonful of yogurt into a bowl of chicken-noodle soup, but it's soooo good. Pomegranate molasses. Really good tomato paste. Sushi. Any question you missed in this meme, that you would have loved to answer? Well then, feel free to add one! Your favorite ice-cream... Discontinued, it was Starbucks' Brownies au Caramel. It was heaven. It's gone. I don't wanna talk about it anymore, or I will get farklempt. You will probably never eat... Lamb testicles (dombalan, in Farsi). I have this fear instilled from years of hearing that girls shouldn't eat them because they will cause hormone imbalances. And besides they're, you know, BALLS. Your own signature dish... Can't say I have just one. Any number of Persian dishes, my strata, a fig & walnut tapenade I serve with parmesan fricos. A common ingredient you just can't bring yourself to stomach... Tinned anchovies. C loves bagna cauda and I gagged just trying to make it for him. Which one culture's food would you most like to sample on its home turf? (Added by Fatemeh)... Mine would have to be Morocco. Amy at Cooking with Amy, Arthur at Arthur Hungry and Meg at I Heart Bacon. Our loft is not what you'd call "well-ventilated". In fact, if we're having a heat wave, the thermostat can climb well into the 85°+ range. On those days, even rooftop grilling seems too draining, and so we often turn to robustly-flavored, nourishing--but still cool--salads. A few nights ago, I improvised a recipe that tilts its hat to Salade Niçoise, a particular favorite of mine. 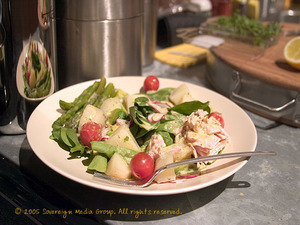 Using what I had in the fridge, I fashioned a salad of baby spinach, radishes, asparagus tips, tomatoes, potatoes, avocado and best-quality tinned tuna, all dressed with a lemony, champagne vinegary, marjoram dressing. 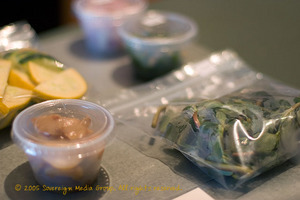 My latest piece for KQED's Bay Area Bites is up, and it's a review of the new Besos Foods "ready-to-cook" kits. I thought the kits were really well designed, and the ingredients were all fresh and very delicious (the garlic confit was to die for, and the stock was better than any I've made at home). 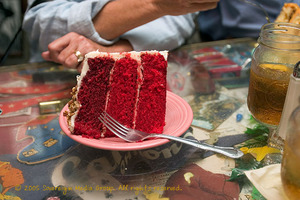 Who knew that Red Velvet Cake would create such a paroxysm of childhood longing from so many people? And who knew that Gastronomie has so many readers who either grew up in, or spent summers in, or otherwise have some emotional attachment to the South? Well, as promised to several of you, I've done some hunting, and have confirmed that the recipe for Bubble Room's Red Velvet Cake, as originally published in the Fort Myers Junior League Cookbook, is accurate. From time to time, a place comes along where dessert really just might as well come first. Because, not only is it what the place is famous for, it's also what the place does best. The Bubble Room (watch out, there's audio) on Captiva Island, Florida is just such a place. So, in honor of that, I'm going to tell you about our dinner there with C's parents backwards -- starting with dessert and ending with bread service. Bubble Room's Red Velvet Cake is C's favorite cake in the world--so much so that I ordered a whole one to be FedEx'd for his birthday a couple of years ago. Its faintly cocoa flavor and moist buttermilk base are the perfect "delivery system" for the luscious cream cheese frosting and pecans. Dad ordered the family's other favorite, Orange Crunch Cake. This one has almonds, cinnamon & brown sugar between its dense yellow layers, and a thick layer of orange cream cheese frosting. You can see here that Dad was so excited that he had to get a tiny bite in before C could wield his camera! Finally, I had to go for Very Moist Chocolate Cake. A bundt cake ("Iza Buunt! "*) layered with fudge toffee and pecan crunch icing, this thing is seriously super-strength. It was enough to keep me awake until nearly 3am! 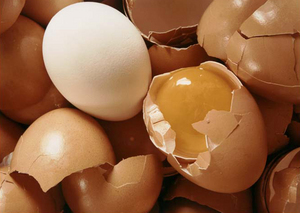 New Gastronomie Forum is open! 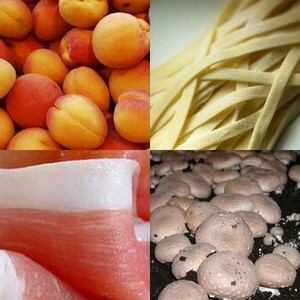 Three different people have suggested that a forum or chat-board of sorts would be a welcome addition to Gastronomie. Never one to back down from a challenge, I've created a Beta forum for us to play in. After a month, I'll decide whether to keep or can it, based on interest and activity levels. So, if you enjoy having the forum, please keep it lively and active -- I hope you guys enjoy this, and I hope it's something that we can keep going together! I realized recently that I haven't been responding to comments on the site -- that I respond to them via email, and had been doing so for some time, thinking it was the "polite" thing to do. Then I thought about how much I enjoy going back to blogs that have "discussions" going in their comments sections. And realized that I wasn't fostering that kind of discourse here. So, my apologies to everyone who's ever come back to see what the answer to a question in the comments was. From now on, I'll be responding to posts here on Gastronomie, instead of via email.